If you are looking for creative nursery design (and bedrooms for children), you must check out the projects done by Little Crown Interiors. Based in Los Angeles & Orange County, the design duo of Naomi and Gerri bring a very individualized and personal touch to each and every room they create. I was all too happy to discover Naomi was doing interior design (like myself) - our famlies have known each other for years and we grew up in the same neighborhood. I think her mom has known me since I was a toddler and I've known Naomi since she was in diapers! How fitting her client's are in diapers, too! Only joking! 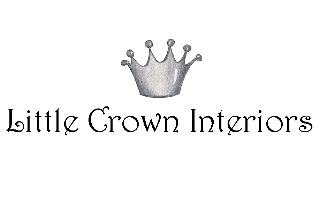 Check out all the fun and creative projects from Little Crown Interiors and be inspired! 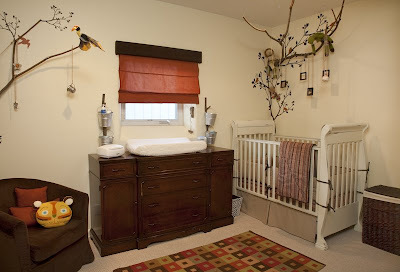 This natural nursery was designed with real tree branches combined with branch decals for a truly original feel. 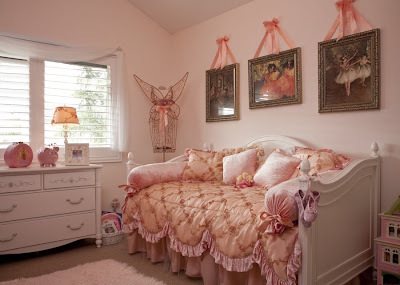 This darling bedroom was designed for a little girl who loves ballet, acting, dancing and of course, everything pink! 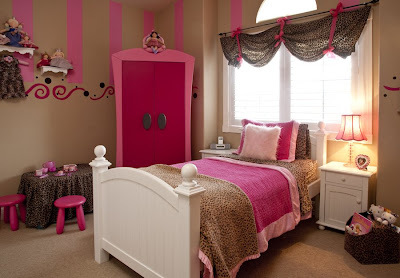 This bedroom was created for a little girl with big style. 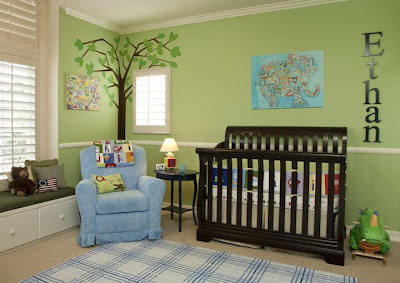 This nursery was designed with green in mind! Combining fresh colors, animals and the alphabet, we created a warm environment for a baby boy to grow up in. 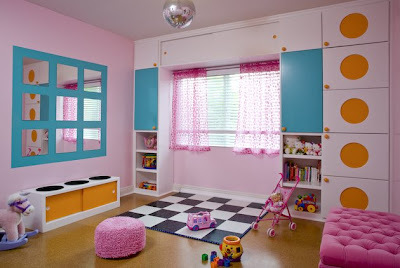 This colorful playroom was designed for two twin girls who love to dance and a mommy who loves disco! 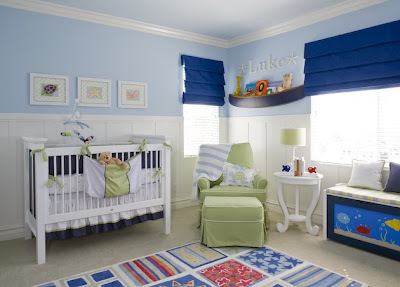 This nursery was designed with a nautical feel with accents of sea-life for a whimsical touch! This nursery was inspired by the Delano Hotel in Miami. A fabric draped ceiling created a cozy lounge feel. This nursery was designed for twin boys. 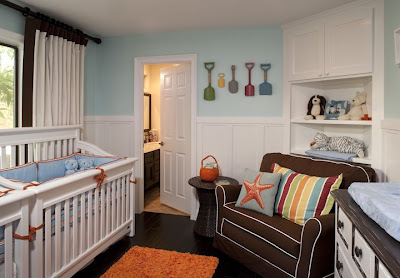 A modern color scheme combined with vintage appeal made this nursery a splash! 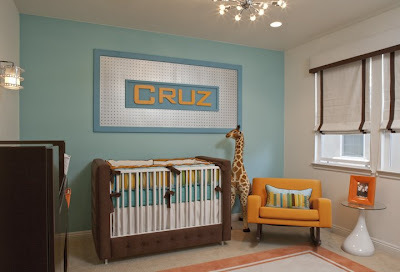 This modern nursery was designed around a custom upholstered crib and a love of all things tangerine! 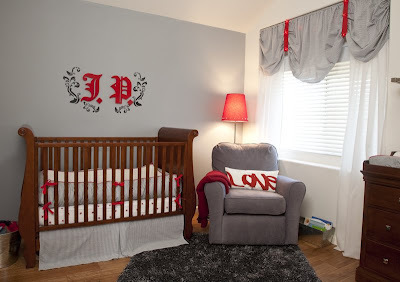 This nursery was created with neutrals and pops of red with twinkling star accents! Happy to announce their work will also be featured in an upcoming book titled "Design Ideas for Baby Rooms" from Creative Homeowners due out in late spring! Check back for my post on the book release. MTV Cribs wants your Teen! Shelves, Shelves, & more Shelves!